HQST 400 Watt Off-Grid Polycrystalline Solar Starter Kit is designed specifically for customers new to solar. This 400w solar kit is great for off-grid applications, such as RVs, trailers, boats and sheds providing many benefits, including, but not limited to, quiet power production and grid independence. This off-grid solar kit comes with the tools necessary for a new system. Start your solar adventure with a HQST Starter Kit!! Designed specifically for customers new to solar. Easy and convenient to install with pre-drilled holes on panels and Z brackets for fast mounting and securing. Used in various off-grid applications that include 12 and 24 volts arrays, water pumping systems, signaling systems and other off-grid pplications. Great for off-grid applications, such as RVs, trailers, boats, sheds, and cabins. 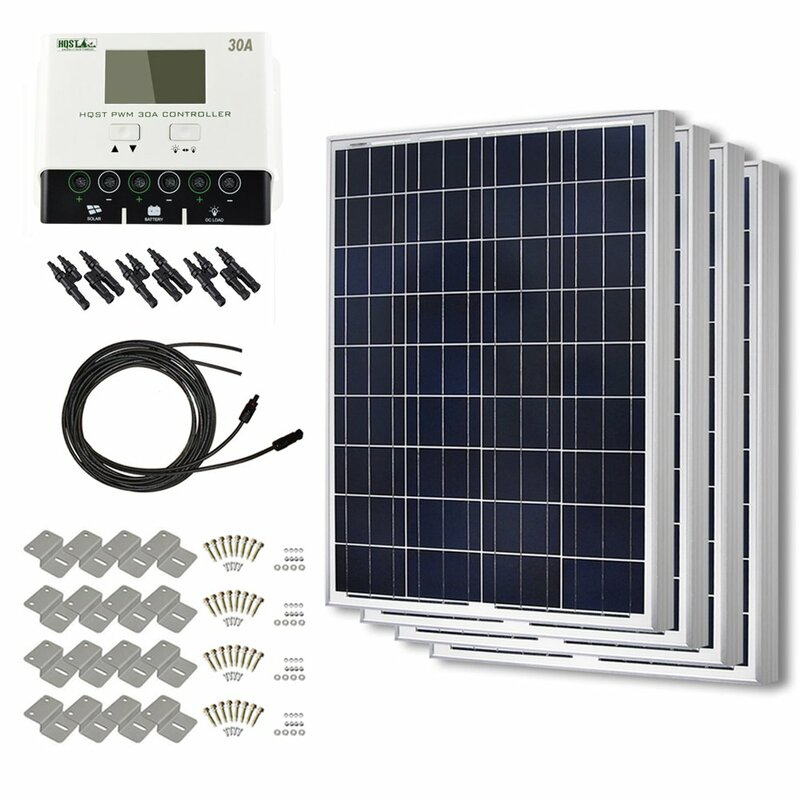 Comes with four 100W 12V polycrystalline solar panels, a 30A PWM LCD charge controller, a pair of 20 ft 10 AWG daptor cables, four sets of Z-brackets, and all necessary mounting hardware.With the 30A PWM LCD charge controller, you can expand your system up to a maximum of 400W. Provides many benefits, including quiet power production and grid independence. Ideal output: 2000Wh per day.